Bodybuilding world champion numerous times. One of the most highly paid actors in the last few decades. And now the governor of California. 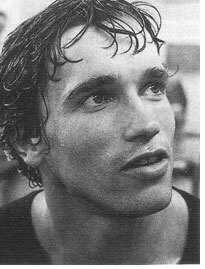 Arnold Schwarzenegger’s resume sounds more like the resume of three men rather than just one. How did he do it? Here are a five clues, success habits and tips from Arnold himself. A very strong belief in yourself can be ridiculously useful. Corny as it may sound, your belief in yourself determines a lot about your journey and your results. But the problem with statements like “Just believe in yourself, man!” is that they don’t come with any practical instructions on how to actually believe more I yourself. So you have a hard time getting anywhere. I have found a few things that have been helpful. First, by realizing that you are able to handle negative stuff that comes your way your belief in yourself and your capabilities grows. You can also work on a similar process voluntarily. By setting goals and achieving them your belief in yourself increases. And by facing your fears and finding that you can indeed survive such experiences your belief in yourself goes up too. None of these options may sound that glamorous, fun or quick. And a lot of the time they aren’t. But like with so much else,you have to put in effort to get good results. But there is also another side to this challenge. Quite a bit of the problem with a lack of belief in yourself comes from internal self-sabotage, self-limiting beliefs and resistance within your mind. It’s you holding yourself back. I have found that reading Eckhart Tolle’s books like “A New Earth” – or books on mindfulness in general I guess – to help you realize that you are not your ego, thoughts or emotions and rereading to strengthen and deepen that belief can be very helpful to reduce the inner struggle, over-analyzing and self-sabotage. Over time you can get better control over your mind and you´ll stop listening so much to your own negative inner voices and emotional resistance. Having a reasonably good handle on that part makes it easier to see yourself doing what you want to do. Because, as Arnold says, you have to be able to envision what you want to do or it will be very hard or just impossible bring that vision into reality. By getting better control over your mind it becomes easier to hold this vision in your mind day after day, week after week. You’ll be less prone to self-sabotage. And your belief will waver less when being questioned or worse by other people or just society in general. 2. See struggle and failure as something positive. Failure is seldom the end of the world. It’s a part of the journey, a part of the learning curve. The problem is just that if you have a scarcity mentality then every failure or potential failure may seem as the sky falling. This can hold you back from performing well. Or from taking action at all. The key to overcome this is to develop an abundance mentality that tells you that there are always more opportunities. This allows you to not take the setbacks too seriously. One way to help yourself to develop such a mentality is to replace some of the usual input – news, advertising – with information and the vibe from personal development authors/speakers. Another way is just to hang out more with people with an abundance mentality. Or just people that are positive and enthusiastic about life. Now, most of the time you only really fail when you give up and surrender. If you keep going you’ll build your inner strength to live and move through rough patches. And if you are able to look at your setbacks and learn from them you can also deepen you knowledge, perhaps avoid some mistakes and find a better course towards your goal. Remember that to succeed you need those failure. They make you stronger and smarter and that build-up of yourself is vital to success. Going the extra mile. It’s not easy. Personally I think this has often been because I have just thought too much. Overthinking often leads to negative thought spirals where you use your mind to decrease your own strength through self-doubt. And if you add up all the overthinking you can waste months or perhaps even years of your life. It’s more useful to just stop thinking when all then thinking that is needed is done. And to then just go and do what you choose to do. And then to learn from your experiences and to keep going. Yep, working out is very useful in more than one way. I have found that one of the best ways to turn an anxious, negative or weak mood fully around is simply to go exercising. It is also reliable because it is not so dependent on your mind. You just have to drag yourself wherever you need to go and make your body do certain movements to get the desired result. And, anyway, how are you going to be able to go the extra mile without extra energy? Over the last few years I realized that many problems are simply based in a lack of energy. So working out or not isn’t much of a choice really. If you aren’t naturally a bouncy, high energy person then you have to exercise in some way to create that energy you need to achieve whatever it is you want in life. 5. Go and help others. Helping others is valuable in so many ways. Beside the wonderful upsides that Arnold brings up – like the fact that you are helping people out and at the same time enriching and adding meaning to your own life – you also create a lot of relationships. And the Law of Reciprocity, the urge to give back is strong in people. If you provide value and help to them then they will often be inclined to give you a hand when you need it. Or feel the need give back by paying it forward and helping other people. This creates big, expanding upward spirals of positive actions and thoughts. And that can be very useful for us all. Great story. Love Arnold’s tips, he is one positive man. What you dream about and focus on, you bring about. My business is exactly what this is all about and I love what I do. Fabulous comments also everyone. this is an outstanding post….. I like Arnold as an actor. And I like his words, for sure true words. Thanks for sharing, Henrik. Very true… If you don’t believe in yourself, how do you expect others to believe in you. This is the number one step to being truly successful! Great post and such inspirational words! Something to print and carry for sure! People love to make fun of Arnold but I think he is amazing and a great example of success. I particularly love this line in your article from him: “When you go through hardships and decide not to surrender, that is strength.” Hell yea. Great set of tips from a man more often laughed at than listened to. Number one is crucial. So many people never really believe they can succeed. And so they never do. Luck is rarely enough; you have to create your own environment for success. And the first step is defining for yourself what success means to you. Excellent ideas about how to get the life we want. They should teach these ideas to students at school and make it compulsory learning. I was taught to help others from a young age, so now I always think about how others can benefit from what I do. Sometimes we might think we are working mainly to make money for ourselves/immediate family, but I believe one of the main reasons we are alive is to serve/help/empower…others by using our talents, knowledge and skills to, ultimately, make the world a better place. This is great stuff from Arnold. It’s hard to argue with his mindset based on the tremendous success he’s created. He is one of the great ones! I really like how you talk about seeing struggles and failures as something positive. I definitely believe that those are opportunities to grow stronger when you use them to your advantage. Awesome post! I never would have thought that Arnold would have been so insightful. Am I the only one that read those quotes in his accent? ?